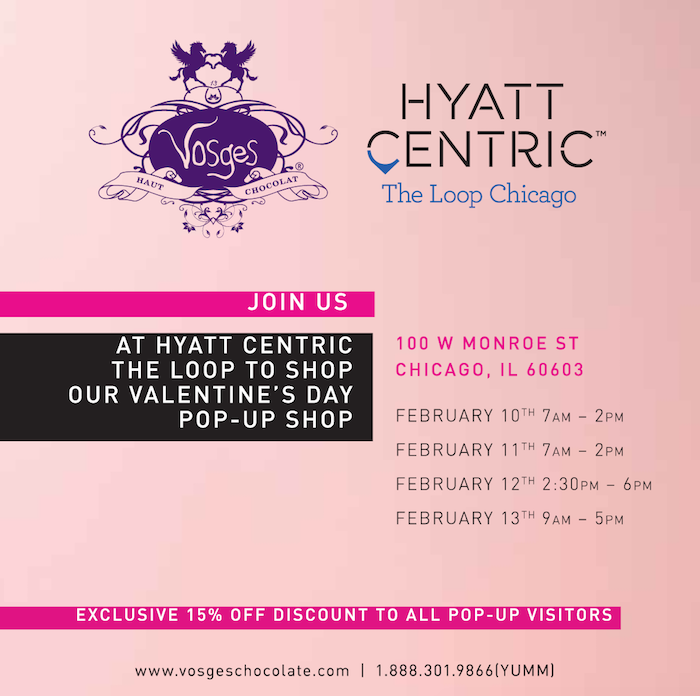 Hyatt Centric Chicago & Vosges Haut-Chocolat are hosting a pre-Valentine's pop-up shop & event. A perfect way to do some last minute Valentine's day gift shopping for your loved one's while enjoying complimentary chocolate samples! At the event there will also be opportunities to receive exclusive discounts at Hyatt Centric the Loop. An invite from us to you, stop in any of the days during the times listed above - we look forward to seeing you there! Share your photos at the event and let us know you're coming using the hashtag #HyattCentricPops on Twitter & Instagram. This post is on behalf of Hyatt Centric Chicago.